Honey bottling bucket with honey gate. Bottling the crop of honey is the fourth step of harvesting. I have found that the easiest way to do this is to use a bottling bucket. 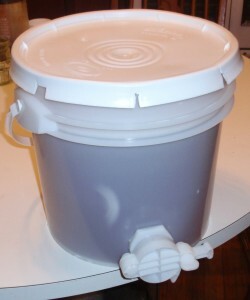 The bottling bucket is made from a food grade plastic bucket by adding a honey gate. I have found the local donut shop to be a good source of used food grade plastic buckets. Click here to see a great how to page for installing a honey gate. The bottling bucket had 3 gallons and 1 pint of honey in it. I like to use glass jars to store my honey. These can be mail ordered from many supply houses, but the shipping quickly adds up. I end up buying cases of mason jars from the local Farm and Fleet store. They always seemed to be on sale at the time of year the honey crop is coming in. In the past I have ordered one piece lids as they are more convenient than the standard canning lids that come with the mason jars. Honey Harvest Step One: Place Bee Escape Boards. Honey Harvest Step Two: Remove Supers. Honey Harvest Step Three: Extracting.